An Arizona Chamber of Commerce and Industry spokesman said business leaders are willing to comply with the enforcement program, but cautioned against the administration taking a “hostile” approach with business owners. 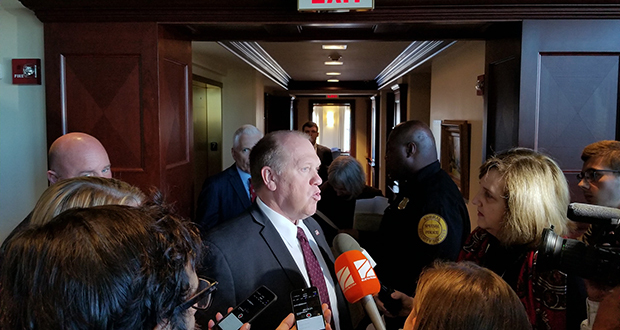 Arizona employers are already required to use E-Verify to check a job applicant’s citizenship status, a policy Homan said he would like to see extended nationwide. Homan’s comments came during a speech at the Heritage Foundation, where he criticized sanctuary cities and defended ICE’s practices of deporting immigrants who are suspected gang members, and arresting them near schools, hospitals, courthouses and other areas that have been off-limits in the past. ICE was one of the federal immigration enforcement agencies that collaborated on an immigration policy priority wish-list released last week by the White House. Among the more than 70 items on the list is a call for employers nationwide to be required to use E-Verify. Use of E-Verify, a federal database that helps employers determine the citizenship status of job applicants, was one of the immigration pledges made by President Donald Trump during his campaign. The administration included a request for $131.5 million in the budget for upgrades to E-Verify, with an eye toward pushing it nationwide in three year. Arizona has long required employers to use E-Verify when making a hire. Despite doubts early on, Arizona Chamber of Commerce and Industry spokesman Garrick Taylor said deployment of the program to state workplaces went smoothly, but he is not sure a nationwide implementation would be as easy. Taylor said that if there are employers “knowingly hiring folks without work authorization, they ought to be punished.” But if federal law does require businesses to use the program, he said he hopes the rollout would be done in partnership with employers. “We would hope that there’s a desire from the administration to work with employers so that employers know exactly what the rules of the road are, how you use E-Verify, and what all that entails,” Taylor said. But immigration advocates said authorities should think twice before making E-Verify mandatory nationwide. Immigrants are needed to fill manual labor jobs that Americans may not be willing to take, said Petra Falcon, executive director of the Latino voter outreach organization Promise Arizona. Rather than deporting them outright, Falcon said the government should work with employers to find a solution to keep them here. “We know that they’re here, we’re inviting them to come and work in the fields, in construction, in this economy and yet they’re not invited to receive the benefits of doing that in this country,” Falcon said. State support for students at Arizona’s three public universities has fallen by 53.8 percent since 2008, more than three times the national decline over the same period, according to a new report.